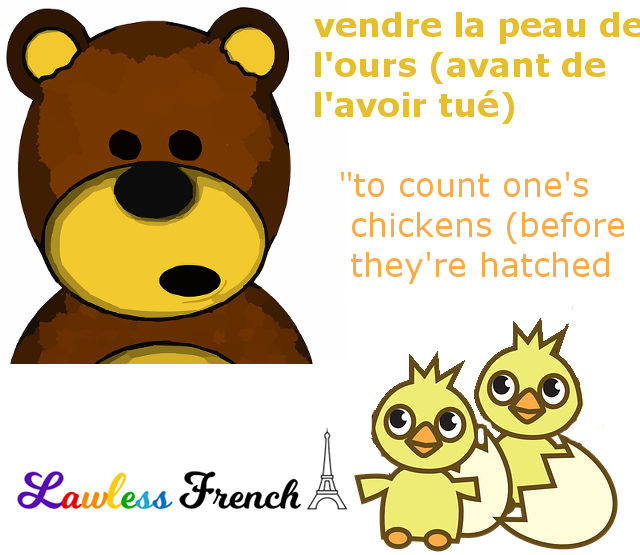 Usage notes: The French proverb vendre la peau de l’ours avant de l’avoir tué is just as vivid and comprehensible as its English equivalent “to count one’s chickens before they’re hatched,” even though the literal meanings are completely different. 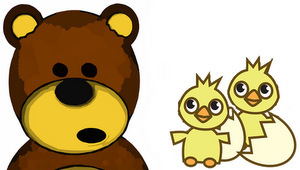 In addition, they can both be shortened to just what you’re not supposed to do (il ne faut pas vendre la peau de l’ours – “don’t count your chickens”), with the second part (avant de l’avoir tué – “before they’re hatched”) implied. I also find it interesting that the French proverb seems to be coming from a hunter’s point of view, while the English is more like what a farmer might say. On ne sait pas encore s’il va nous aider… il ne faut pas vendre la peau de l’ours avant de l’avoir tué. We don’t know if he’s going to help us yet… don’t count your chickens before they’re hatched. Je pense que l’entretien s’est bien passé, mais je ne vais pas vendre la peau de l’ours avant de l’avoir tué. I think the interview went well, but I’m not going to count my chickens before they’re hatched. Grammatical note: The construction avoir tué is called the past infinitive.